Sieve maida. Prepare dough for puris by stirring salt in ½ cup of water and adding ghee and sufficient quantity of maida & chapati atta. Knead properly. Cut curry leaves, green chillies and ginger. Prepare a blend of coconut gratings, chopped ingredients, salt and asafoetida water. Season with mustard, black gram dal, red chillies and curry leaves in oil. Combine rava and Bengal gram flour with it and keep aside. Shape small part of the dough into balls, and roll them into puris. 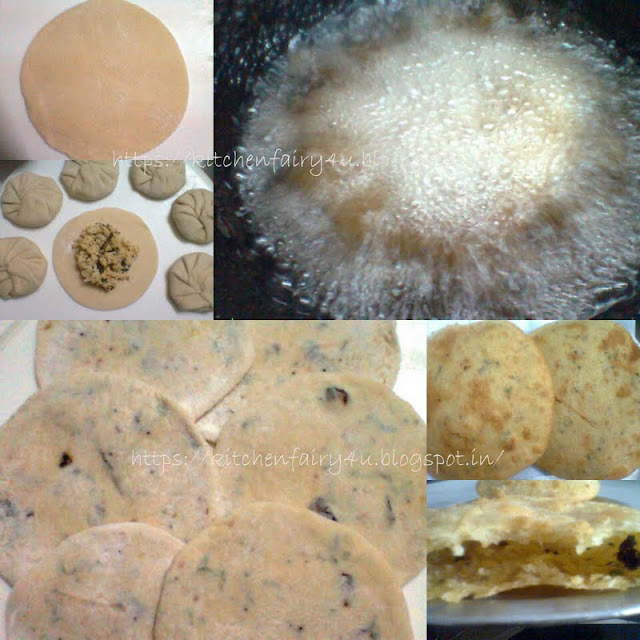 Put a pellet of dough on each puri and cover in fully by gathering up the edges. Roll again into biscuit puri. Finish thus with all the puris and the blend. Deep-fry them in hot oil, till it turns golden brown and crispy.